HIM Briefings is now hosted on Revenue Cycle Advisor. Subscribe now! HIM Briefings is now hosted on Revenue Cycle Advisor! 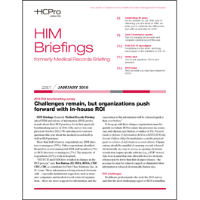 For over 30 years, HIM Briefings, formerly Medical Records Briefings, has been providing HIM professionals with the tools and guidance needed to keep up with an ever-changing regulatory landscape. Your subscription to HIM Briefings, part of our Revenue Cycle Advisor suite of tools and resources, provides time-saving tools and expert advice and analysis to help you effectively manager your evolving HIM challenges. Benefit from an exclusive suite of resources. As a HIM Briefings subscriber, you gain access to the latest revenue cycle news, analysis, and education hosted on Revenue Cycle Advisor. This comprehensive website combines all of HCPro's revenue cycle regulatory, compliance, case management, HIM, and reimbursement resources, giving you a single trustworthy tool to help you navigate the ever-changing healthcare landscape. In addition to accessing your HIM Briefings content, you will have a vast library of revenue cycle tools and education at your fingertips. Want to renew your HIM Briefings subscription? Call customer service toll free at 800-650-6787 or email customerservice@hcpro.com for a special discount!